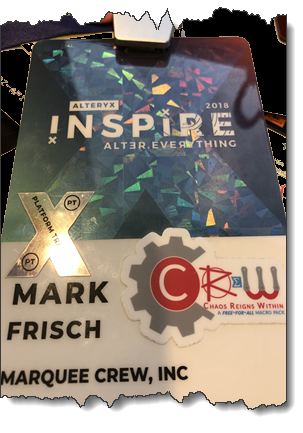 #Alteryx18 marked the beginning of a journey for me. I've long been on this quest, but now take the lead as Adam focuses his efforts on family and Alteryx e2. My first CReW action was the creation of new SWAG. These die-cut stickers were gobbled up in Anaheim and I've reserved more for my friends at #Alteryx18 in Europe. 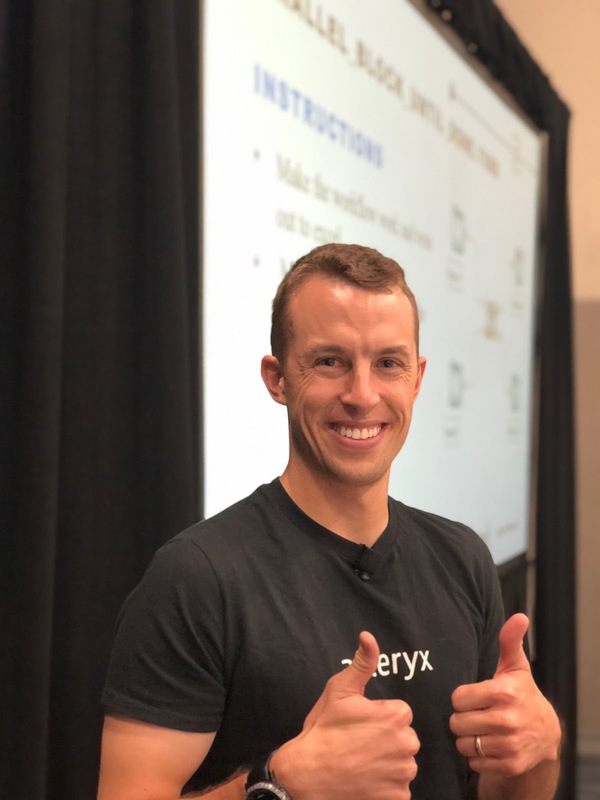 Second on my list of accomplishments was the assumption of the CReW Macro training (only scheduled in Anaheim for #Alteryx18). Together with Joe Miller from Alteryx we either wowed the attendees or we gave sufficient pleas for good survey results (9.6/10.0). Putting CReW macros to the "test" and opening eyes about how to create value from these gems really sunk home as users (beginner to expert) were enlightened by their seeming simplicity, but awesome results. "Oooohs and Aaaahs" abounded as we delighted the students with tips and tricks. Defensive configuration and use of CReW tools took center stage as Joe provided step by step instructions and I added colour to the session. Where do we go from here? I want to hear from you! What ideas and what needs do you have? I've created some beta macros (they are in the macro district of the Alteryx gallery), but CReW is more than just one person. Whether your an Alteryx guru or a newbie I can use your skills. Macros need naming, icons need designing, and we also need to manage the CReW inventory. Please let me know your thoughts and availability to join the CReW. I'm very honored and excited to carry this torch. Join me and let's make Adam proud.